In any type of media, whether it be in books, video games, TV, movies, or anime, there are certain…”bones” to genres. These bones are what hold each genre together, an essential cornerstone to that genre. Based on a series of light novels authored by Shiori Ota, Beautiful Bones: Sakurako’s Investigation has every bone required to have a great mystery, such as the sociopathic genius and the mysterious deaths that are always most foul. However, while Beautiful Bones may have the bones required for a great mystery series, it lacks the muscles and skin to make it perfect. Regarding its core concepts and from a technical level, Beautiful Bones was well done, but everything else seemed mediocre and at times…even boring. Beautiful Bones: Sakurako’s Investigation starts off extremely well. In the first episode, we are introduced to our two main leads as well as two very important side characters. We begin with the real main character, Shoutarou Tatawaki, who is your basic kind-hearted and moral-driven high school student…in other words, he’s extremely boring. Additionally, we meet Yuriko Kogami and Itsuki Isozaki, a student and teacher at Shoutarou’s school respectively, who end up becoming very relevant in later mysteries. Finally, we are introduced to the titular and poster girl of the series: Sakurako Kujo. 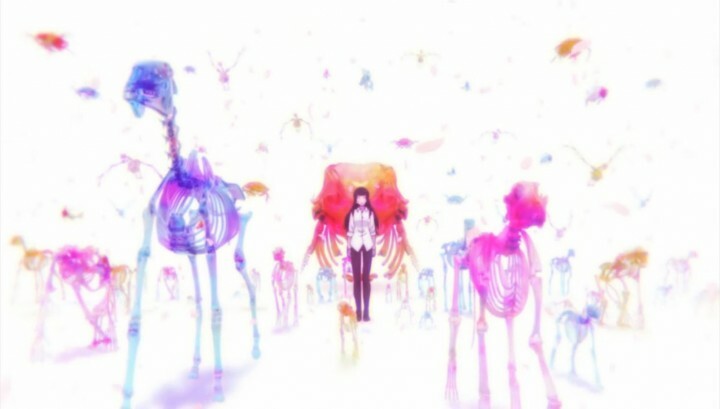 Sakurako is the sociopathic genius I had mentioned earlier, and due to her job as an osteologist, has an affinity towards bones, particularly that of humans. Think of her, for lack of a better term, as a female Sherlock Holmes. The first episode was mostly introducing the main cast, which it did pretty well. 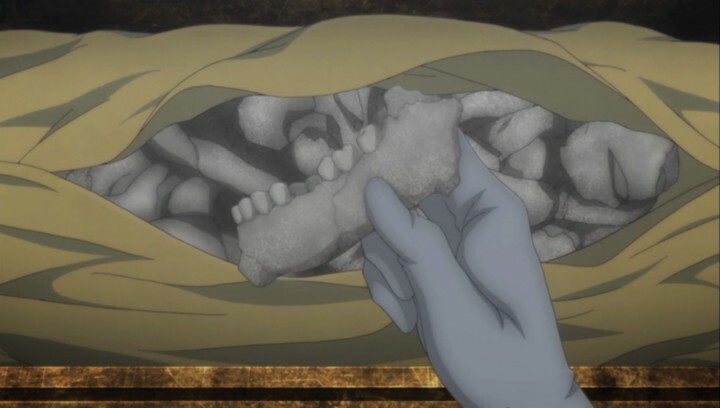 For the two characters that actually matter, Shoutarou and Sakurako, we get an interesting impression of their relationship, as whenever they go looking for bones, the two are bound to find human remains. A problem with the first episode, though, was that it felt anti-climatic at the end, even if it was meant as a bit of an exposition heavy episode. Sakurako was able to deduce that an apparent double suicide was in fact a double homicide…and they never touch upon this again. 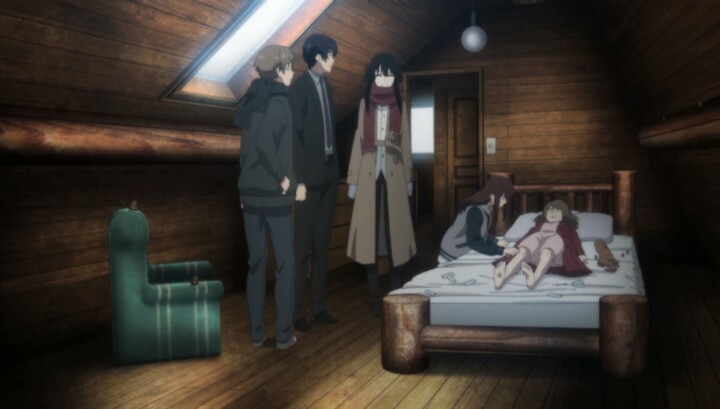 This was to show Sakurako’s high level of intellect and analytical skills, yet not having the killer caught or even identified felt kind of lazy to leave open as a loose thread. Episode two was by far my favorite episode in the entire series, making for a great first “official” mystery. It begins when Shoutarou finds a little girl, who refers to herself as Li-cha, by herself in the middle of the night. Bringing her to the local police station, it’s discovered that there was no way of actually contacting her parents. Naturally, Shoutarou contacts Sakurako in order to help find the girl’s mother. “Anticlimactic” is a term you’ll hear me say a lot. What was really so enjoyable about this mystery in particular was how each revelation in the case became progressively darker and added more tension into the story. This all culminates into an absolutely beautiful climax at the end of the episode, which has a mixture of extremely high tension, dread, and a bit of action. However, the end of the climax was, ironically, a tad anticlimactic — which is a term you’ll hear me say a lot — but it was still delightfully enjoyable. The second episode also introduces us to a piece of Sakurako’s past: her deceased younger brother, Soutaro, who Shoutarou reminded her of. In a fit of panic, she screams out the name of her younger brother, accidently in reference to Shoutarou. When I first saw this, I originally thought it to be too coincidental, and wrote it off as either lazy writing or an intentional plot point. Spoiler alert: They never resolve this plot point. Unfortunately, we next go from my favorite episode to a completely disappointing one. The story revolves around one of Sakurako and Shoutarou’s ventures out into the wilderness to find animal remains in hopes of adding them to Sakurako’s bone collection. As they go through a forest path, they hear a couple cry out in terror due to finding a human body. The police were called, and the death ruled a suicide by investigators. 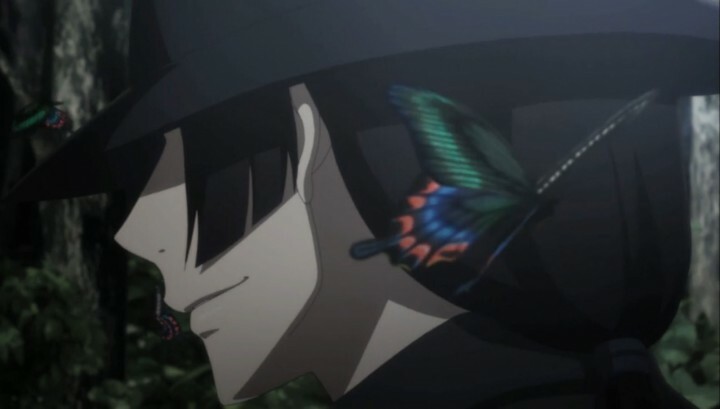 However, it is revealed that the deceased woman in the woods was actually Kogami’s grandmother. 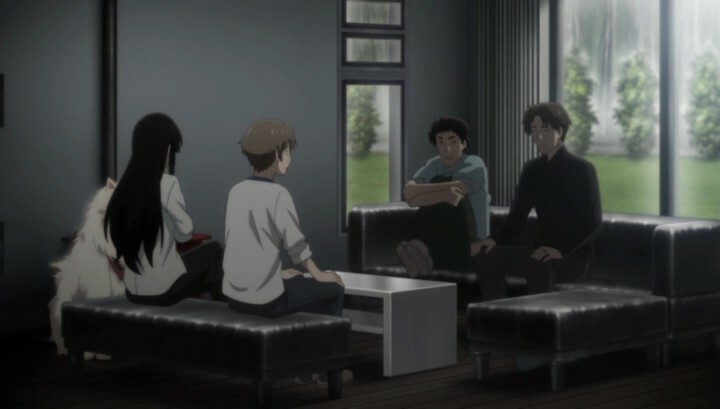 At Kogami’s behest, Sakurako and Shoutarou begin investigating the circumstances behind her grandmother’s death in order to give closure to her, since she didn’t believe it was a suicide. The main reason this arc was so disappointing was not just because of how much a let down it was from the previous episode, but by how anticlimactic it was. When it’s revealed how and why Kogami’s grandmother died, it doesn’t really feel that exciting or like that much of a breakthrough. Even when they revealed the reason she died in the first place, you really realize how predictable said reason was if you’ve been paying attention so far. Episodes four and five were a two parter referred to as “The Cursed Man,” and I enjoyed every minute of this arc. 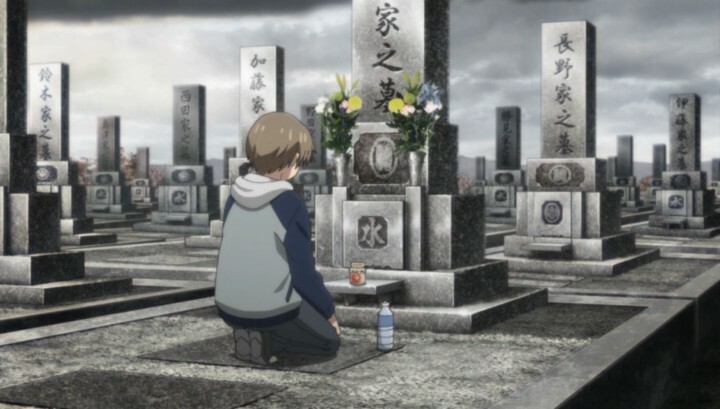 The premise is that in a man named Fujioka’s family, most men die a premature death, especially when they were extremely young. 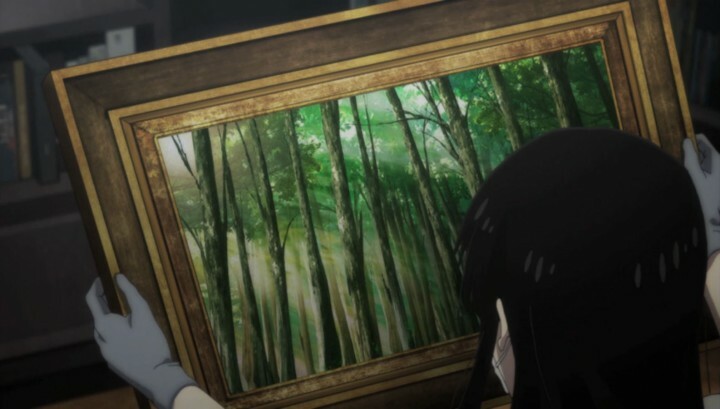 Fujioka is terrified that he is next, as he inherited a supposedly cursed dog and painting from the last family member to pass away. Sakurako and Shoutarou are called to try and debunk the idea of the curse, and to put to rest Fujioka’s fears. The revelations are just subtle enough to go unnoticed if you’re not careful. Progress in the mystery is slow, as most of the information is presented to us over the course of an admittedly drawn out, yet engrossing episode. Although, after the first episode of this arc, the explanations and revelations are plentiful. What’s even more wonderful is the fact that these revelations and explanations are just subtle enough to go unnoticed if you’re not careful, but if you were paying close attention, they seem completely plausible. Throughout this arc, we are also given a glimpse and hint of the main antagonist of Beautiful Bones, without officially being introduced to him. I personally like how they decided to build up the suspense and mystique inherently brought by the very existence of his character. He’s like a shadow you see out of the corner of your eye; you remember seeing him, but you begin to wonder if he was just part of your imagination. In all, “The Cursed Man,” as an arc, was perfectly paced for what it was, which was meant to be an unsettling atmosphere slowly turning into a horrifying catastrophe…well, for the people involved, anyway. The following four episodes nearly ruined the entire series for me, as I had to sit through a lot of boring nonsense. Episodes six through nine were the designated “character development episodes,” where the author forces us to learn more about the cast by enduring a gauntlet of dialogue and exposition. The show warps the cases to fit in character development. Now, I’m not saying that I don’t enjoy character development. Far from it, as some of my favorite characters in anime changed substantially throughout their series. The difference here is that they didn’t organically craft the character development by way of having an interesting mystery to coincide with the characters’ growth. Here, in Beautiful Bones, they prioritized the character development to the point of warping the case in order to fit in with said development. 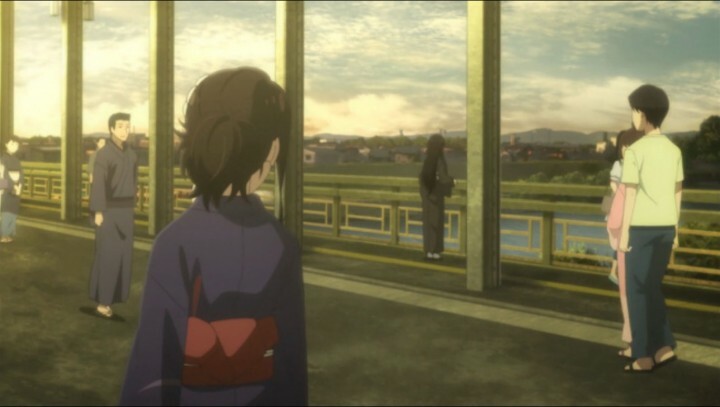 For example, in episode six, there was the mystery of trying to prevent a girl from committing suicide. That idea on its own is actually pretty enticing, as the stakes are high and it’s a race against time — perfect for a mystery. However, we never see the girl again, and instead spend the episode talking about how Kogami — Kogami of all people — is changing as a person. Next was a two part story about how Shoutarou views Sakurako’s humanity. This wasn’t a bad idea, per se, as Shoutarou does always seem to just accept that Sakurako likes to find and play with dead things. What really annoyed me was the mystery that seemed to just be thrown in halfway through. Even though the mystery itself wasn’t too bad, the episode took too much time to just get to the actual mystery, and instead focused on the relationship between Shoutarou and Sakurako. As a result, the investigation seemed rushed, and didn’t get as much attention as it should have. It’s a shame, because it was actually quite the touchy tragedy as well. Finally there was an episode talking about Shoutarou’s grandmother who died of cancer. Honestly, even though they were trying to develop Shoutarou, the entire episode was just sitting around with everyone trying to figure out why Shoutarou’s grandmother always asked him to buy pudding before visiting her. It was pointless, besides the need for developing Shoutarou, which it didn’t even do that well. His character never really changed, as he was still his strong-moral-filled self. The only really interesting event in the episode was near the end, when the anime began to hype up the idea of the serial killer again; I had begun to wonder if they were ever going to follow up on him. 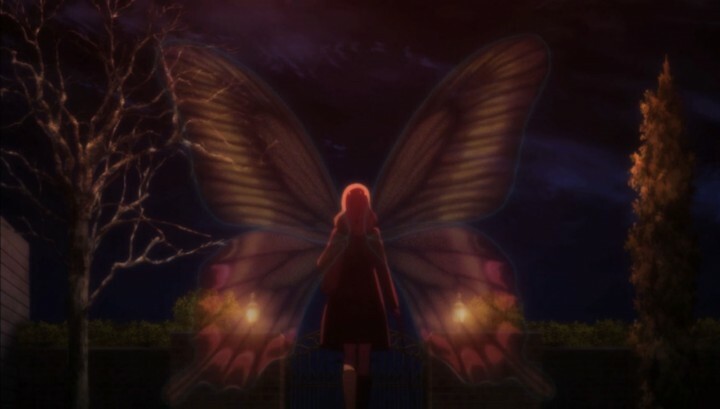 The final arc in the series is called “The Butterfly Vanished in November,” and was excellent in mixing character development with a great and mysterious story. It follows the other character I mentioned way back near the beginning, Itsuki Isozaki, who teams up with Sakurako and Shoutarou to try to solve the disappearances of his former students. This story’s pacing was decent and relatively brisk, but where it really shined was when we started learning the backstories of the students. It was so tragic, heartbreaking, and depressing that I felt something myself. 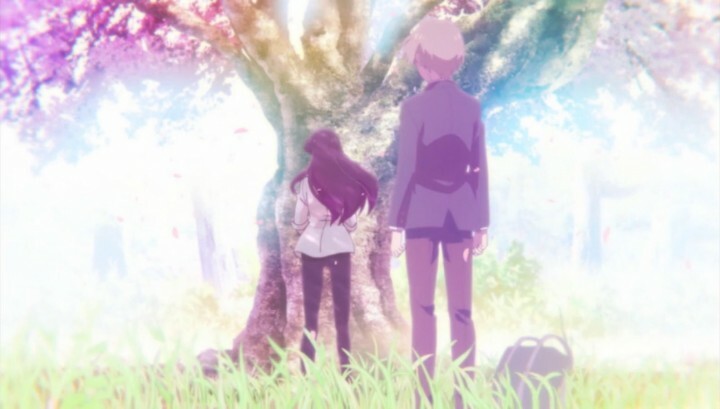 And as per Beautiful Bones‘ style, these feelings were changed to horror and complete shock later on as you learned what happened to the third student. The main impact of this arc, in the long run, was revealing the name of the serial murderer that we had hints about earlier. 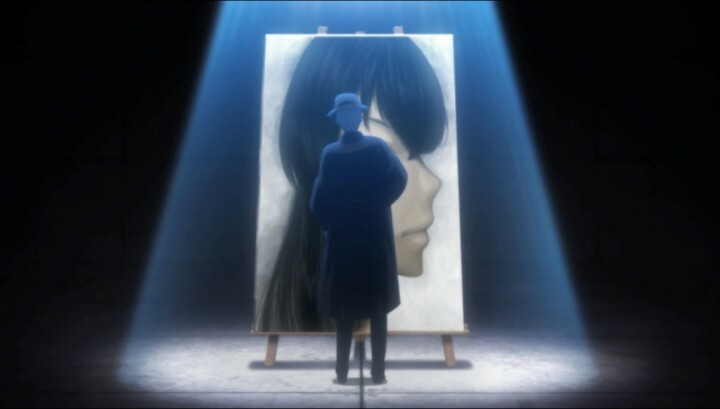 His name, Hanabusa, is that of a famous painter who had been referenced throughout the series, and he was responsible for many cases that Sakurako and Shoutarou worked on. An enigmatic killer, he would talk his victims into suicide with a silver tongue. To me, that is a brilliant concept for the main antagonist of a mystery anime. A complete psychopath who, even when you know his identity, is still an enigma. I felt it was well executed, and was ready for him to be confronted in the final episode! But boy…oh boy, were my dreams dashed against the wall. We get a flashback episode instead of a final confrontation with Hanabusa. 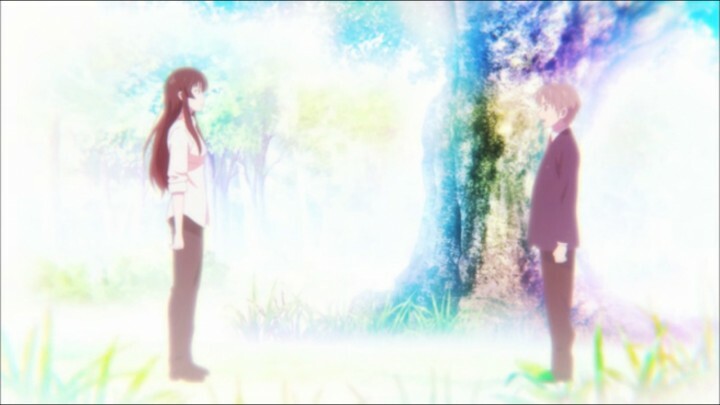 The final episode was a flashback to when Sakurako and Shoutarou first met. We needed this episode, but this should’ve come much sooner, and not in place of the final conflict. When it comes to an anime, the final episode is usually supposed to be the dramatic confrontation, the emotional outburst, the last hurrah. Yet what we ended up getting was just more development between Sakurako and Shoutarou as Sakurako learned how to not be overprotective of Shoutarou. Now, the final encounter between Sakurako and Shoutarou wasn’t bad, in fact it was really well done. The animation was pretty, the dialogue was quite decent, and the music and facial expressions were on point. But I feel that for a final episode, this doesn’t belong, and it ruined the epilogue story arcs for me. Then after the credits there’s a special little cut scene that shows Hanabusa, and it’s pretty unsettling and creepy. But I felt like it should have been a part of the final episode to give us some semblance of closure — it’s obvious they’re leaving room for a sequel. As I’ve stated before, at the level of its concepts and design, Beautiful Bones is surprisingly good. However, when you go beyond the bones that hold up this anime, you begin to see the flaws that are present in the show itself. Some of the mysteries are either pointless, not explored as well as they should have, or are extremely anticlimactic at the end. The series also had some great characters, the most notable ones being Sakurako, Shoutarou (in a few cases), and Hanabusa. 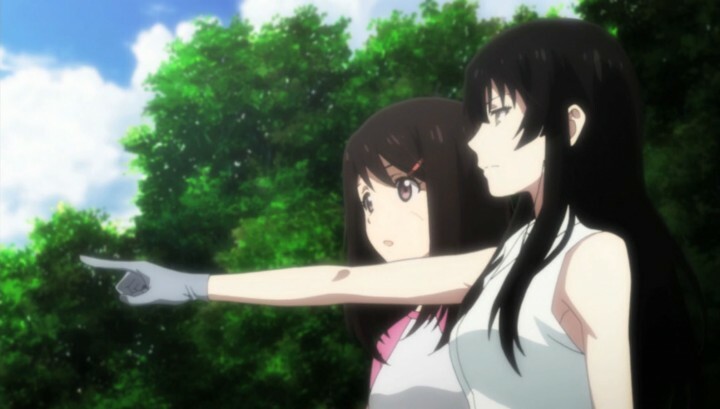 In short, the series had great potential to be the next mystery anime of legends, but it fell flat on its face when it tried to make itself unique.